Don't see your preferred streaming software on this list? NodeCG graphics require Chrome 49 or newer. 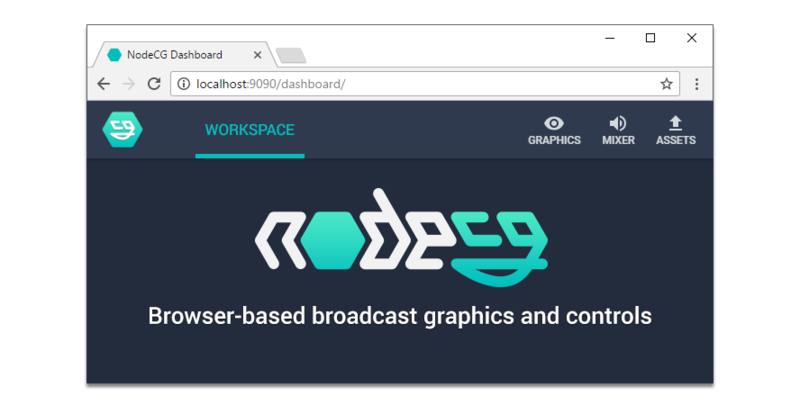 If your streaming software's implementation of browser source uses a build of CEF that is based on at least Chrome 49, chances are that NodeCG graphics will work in it. You can check what version of Chrome your streaming software uses for its browser sources by opening whatversion.net/chrome as a browser source. Looking for a list of NodeCG bundles and resources? Check out awesome-nodecg. Have questions about NodeCG, or just want to say 'hi'? Join our Discord server! Install Node.js (version 8.3 or greater) & npm (version 2 or greater). Looking to get started developing bundles? Check out the Quick Start tutorial. To run NodeCG in production, pm2 is recommended. NodeCG's individual graphics packages are called bundles. They can be installed either from the command-line (via nodecg-cli), or by simply placing the folder into the ./bundles directory. The easiest way to install bundles is via the command-line using nodecg-cli. You will need to install nodecg-cli before you can use the nodecg terminal commands. Bundles are just directories inside the ./bundles folder. They can always be added and removed by simply moving them into or out of that folder. Avoid installing or uninstalling bundles while NodeCG is running. Install a bundle to the bundles folder. Start NodeCG (node index.js or nodecg start if you have nodecg-cli installed). Open the dashboard (http://localhost:9090 by default). Open a graphic from the "Graphics" menu. You can configure NodeCG by creating and editing cfg/nodecg.json. ./cfg/nodecg.json is an optional file that you can create to configure NodeCG. See the NodeCG Configuration tutorial for more information on configuring NodeCG. Graphics: Visual elements to render and broadcast. Dashboard Panels: Controls used to manipulate and manage the bundle. A bundle can have multiple graphics and dashboard panels, and an extension can be split up into multiple files. If you wish to quickly start a new bundle from a template, check out the Quick Start tutorial. A breakdown of the terminology and concepts used inside NodeCG can be found here, on the NodeCG website. Note: Make sure you run npm install in the root directory without the --production flag to ensure all devDependencies are installed. Ensure your code matches our existing style using our provided EditorConfig options. Ensure the existing tests pass, or are updated appropriately, with npm test. For new features, you should add new tests. Documentation contributions are always welcome and very appreciated! NodeCG's documentation site, nodecg.com, is automatically generated based on NodeCG's JSDoc comments and the markdown files in the tutorials folder. The table of contents in this README is also automatically generated. After that, you can open docs/index.html directly in your web browser. Once you've made your changes, follow the steps above in the Contribute section to open a pull request. You no longer need Selenium to run browser integration tests. Chromium is installed with npm install/npm ci, and that's all required for tests. Note that all contributions and discussions around NodeCG take place under our Code of Conduct.